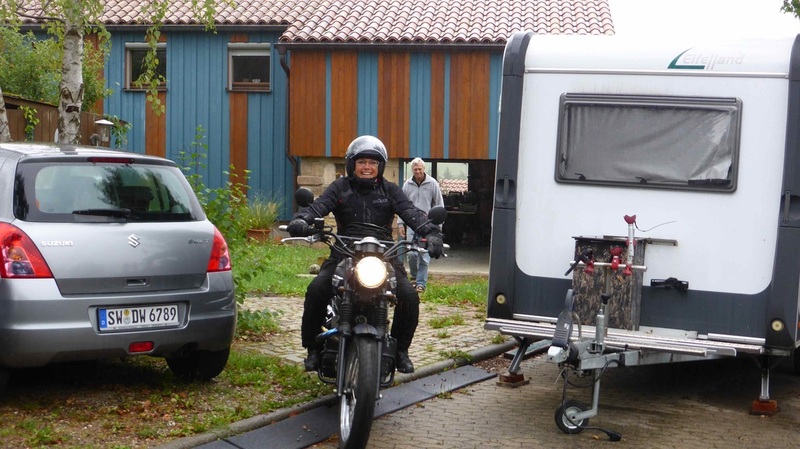 We left the B&B under very dark cloudy skies with the intention of having a look around Hamburg, but a combination of roadworks and an accident meant the traffic was at a standstill for miles, so we turned off and headed down towards the Netherlands, our destination for the night. We had posted on the HU site we would be in the area, and Egbert from Enschede had responded that we could stay with him on our way through to Amsterdam. We had planned a route using backroads, but then the rain came, and after getting cold and wet for a while, the novelty wore off, and we just wanted to get there, so we found a motorway and just rode the miles. Not the way we like to travel, but it seemed like the best option then. 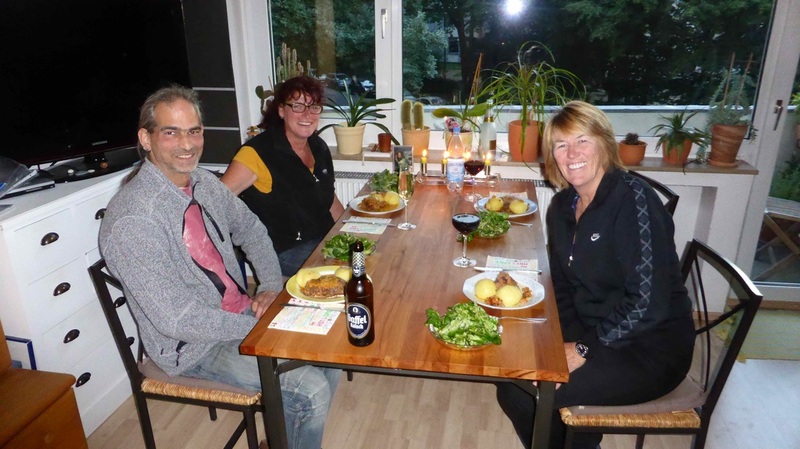 Lyn, Petra, Egbert and I at their place, after the wheel bearing repair. 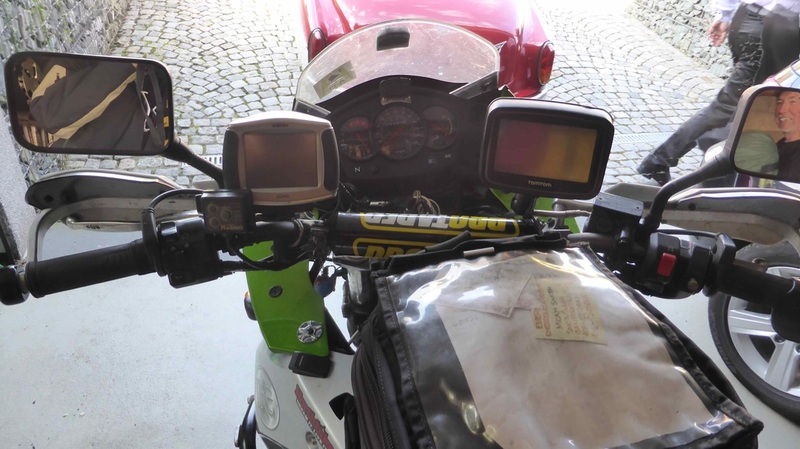 About 50 kms from Enschede, Lyn said the bike didn't feel right, but following her I couldn't see anything wrong. It got worse, so with 22 kms to go we stopped for a good look, and I found play in the rear wheel bearing. We limped into Enschede slowly, where we were met by Petra, Egberts girlfriend, and were shown a place to work on the bike. I had spare bearings with me, and before I could finish the repair Egbert arrived home to give me a hand. Job done, then we had a great meal put in front of us by Petra, then were joined by some of their friends, also bike riders. A great night chatting with a few drinks, time flies when you are talking to like minded people. Thanks guys for your hospitality. 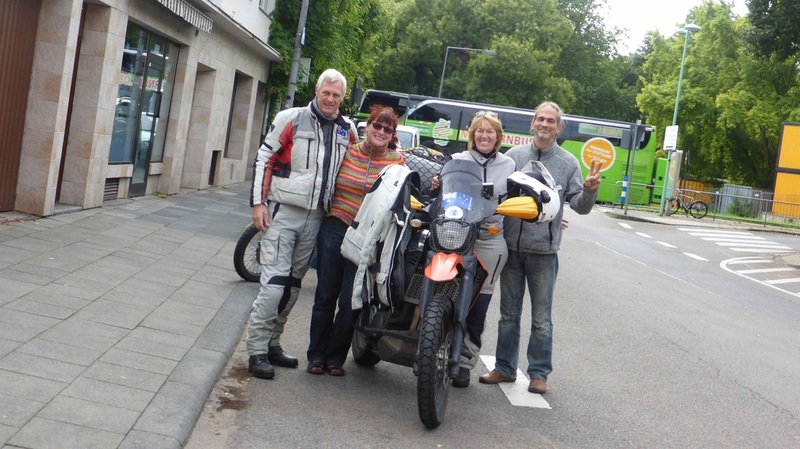 We had told Michael and Ruth, a German couple we met and rode with in Morocco last year, that we would meet them in Cologne on Friday night, due to their work commitments, so we left Amsterdam in pouring rain, for the cold wet ride back into Germany. The rain did get lighter as we got closer to Cologne, but with the weather as it was, we stayed on main roads and headed straight for their place. 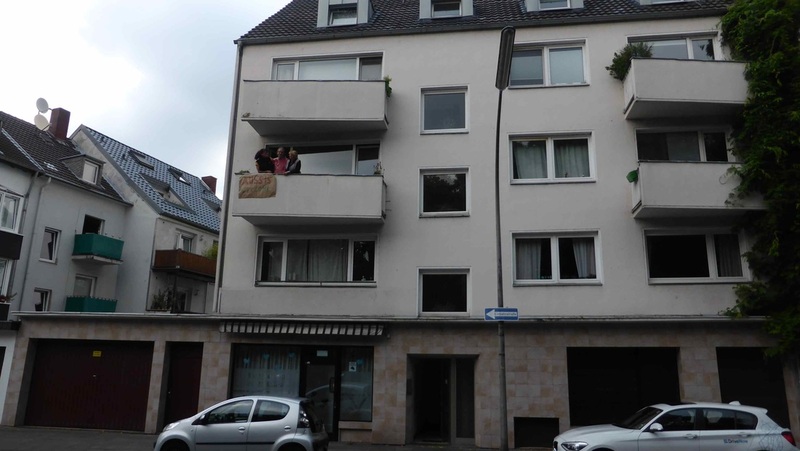 The GPS did its job again, and as we rounded the last corner to their place, we saw the "Welcome Aussies" sign they had made up for us, and hung over their balcony, with them waving at us from above it! A great reception, thanks guys. Living in an apartment, parking is at a premium, but Michael had arranged parking for the bikes at a garage down the road a bit, so we unpacked them on the street and then got them put away. The welcome sign we saw arriving at Michael and Ruth's place. Dinner and a drink with Michael and Ruth. More great times with them for the next couple of days, really good to see them again. 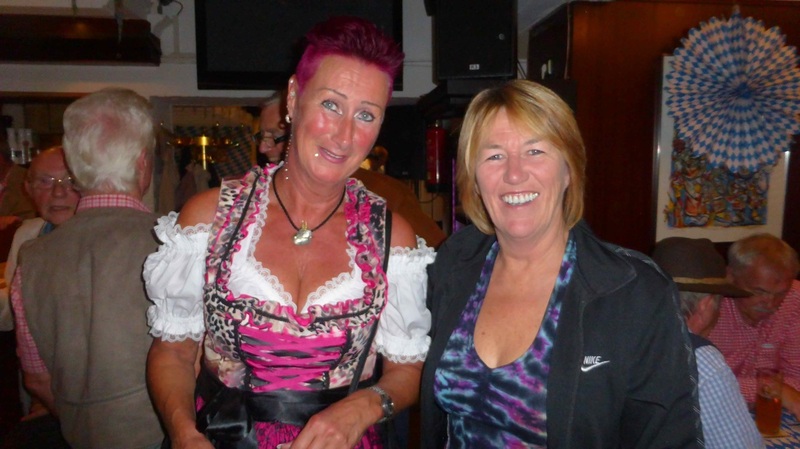 We did a bit of sight seeing, and topped our visit off on the last night with dinner at a Bavarian pub not far from their place. Michael gave me a hand to get the broken pannier bracket welded up, and we changed the routing of Lyn's clutch cable to make it a bit easier to pull in. 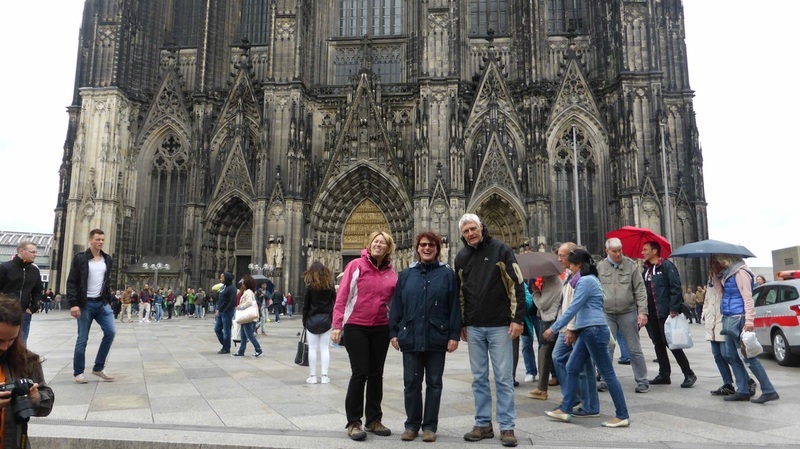 Lyn, Ruth and I at the Cologne Cathedral. Leaving Michael and Ruth's, thanks guys, it was great seeing you again, and thanks for having us! The next day dawned wet and rainy, but Daniel and Sabine were off to Italy on their Triumphs regardless, so generously offered to let us stay another day, as the weather was supposed to improve tomorrow. Thanks guys, your hospitality is amazing, we look forward to returning it when you get to Oz! 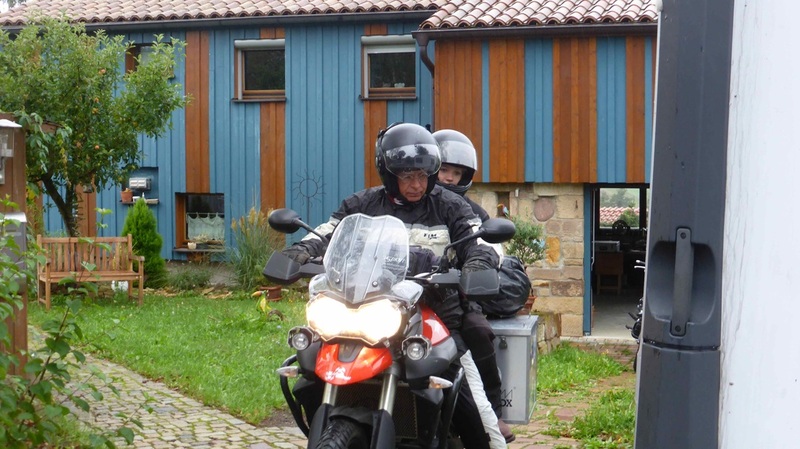 The last leg of our trip this year was the ride to Neumark, where Denis and Nads lived. Their wedding was coming up, and we were lucky enough to be invited. The ride to Neumark was uneventful, still damp, but a lot better than the day before, besides we were getting used to it now. Nads, Denis, and their families made us incredibly welcome (again), and it was great to see them again, a bit like coming home. Everyone was busy doing the final preparations for the wedding, so we tried to stay out of the way. 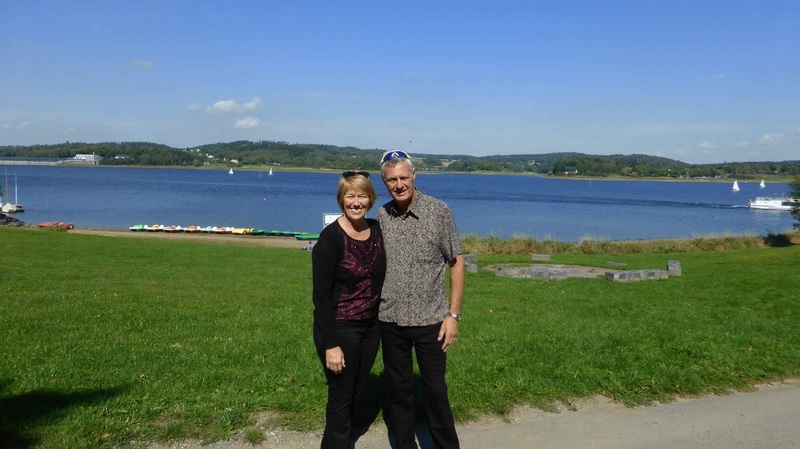 We also caught up with Jeff Smith here, (Smitty Gone Rideabout), we had been talking to him for quite a while on Facebook, and were about a week behind him going through Scandinavia, (we got the good weather then). Stefan and Simone generously offered him somewhere to sleep as well, so they really did have a house full, at a busy time. Jeff and I did some work on his bike as well, just trying to sort a couple of small problems. Nads' and Denis' wedding was fantastic, very different to an Australian wedding, lasting from about 11.00am to the early hours of the next morning, and they say aussies can drink......... The wedding was preceded by drinks and a party at the grooms parents house, where a tradition involving smashing china takes place. 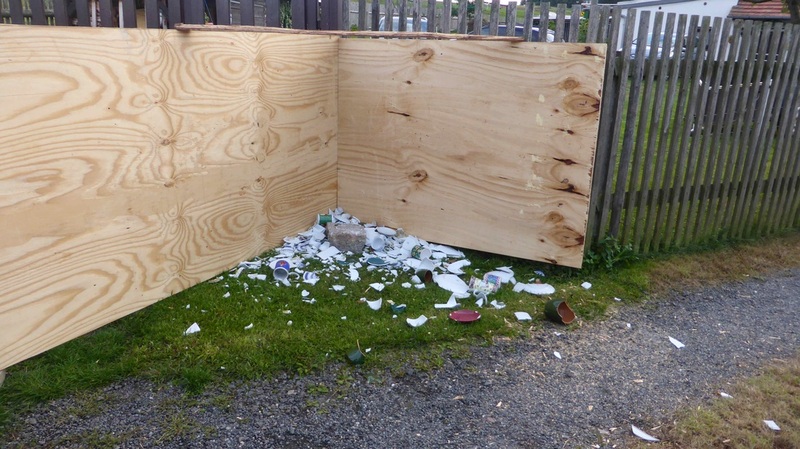 The area where china is smashed, by the end of the night there was a huge pile of broken china here. Every guest brings some china to break as a sign of good luck for the newlyweds. 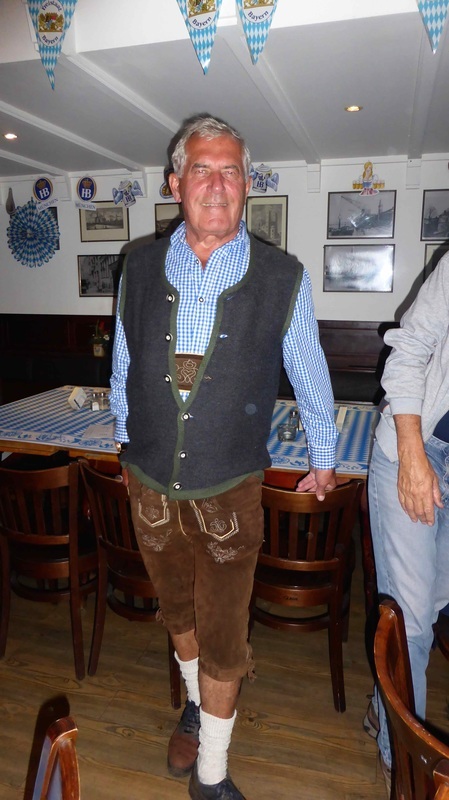 The party lasted well into the early hours, and what a great night, with Denis' father handing out trays of Schnaps, which really did go down well. Too well, in fact........ 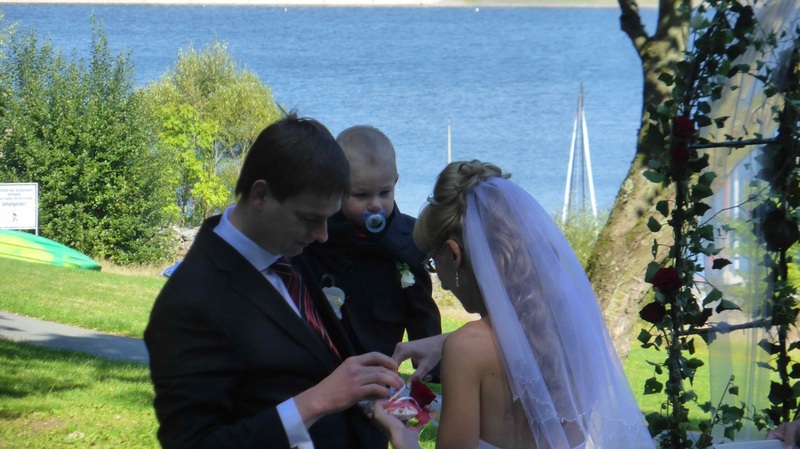 The wedding itself was superb, set beside a lake, and then the reception at a hotel in town. 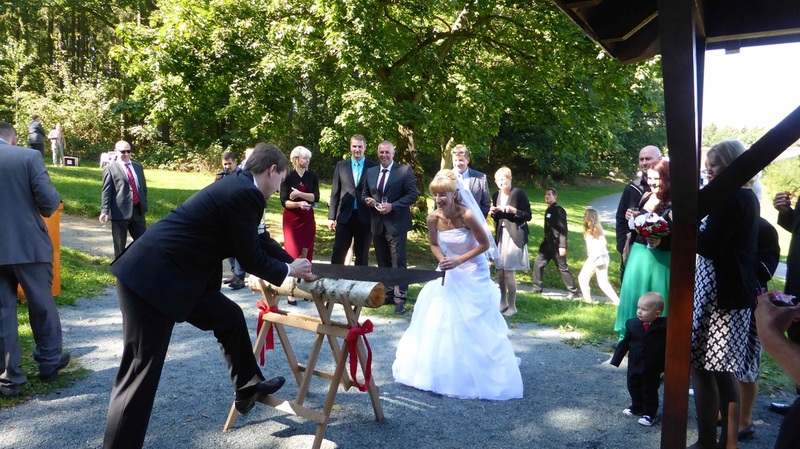 They have some very different traditions to Australian weddings, one is the couple sawing through a log, to symbolise the couple overcoming obstacles together as they go through life. 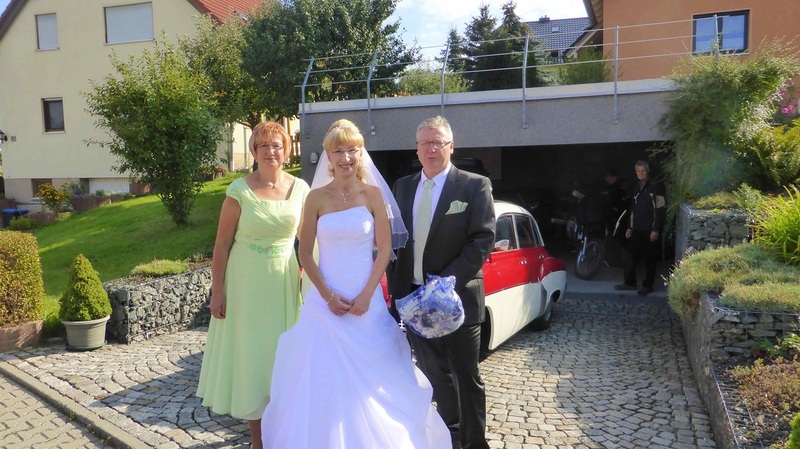 The gorgeous bride just before the wedding, with Simone and Stefan. 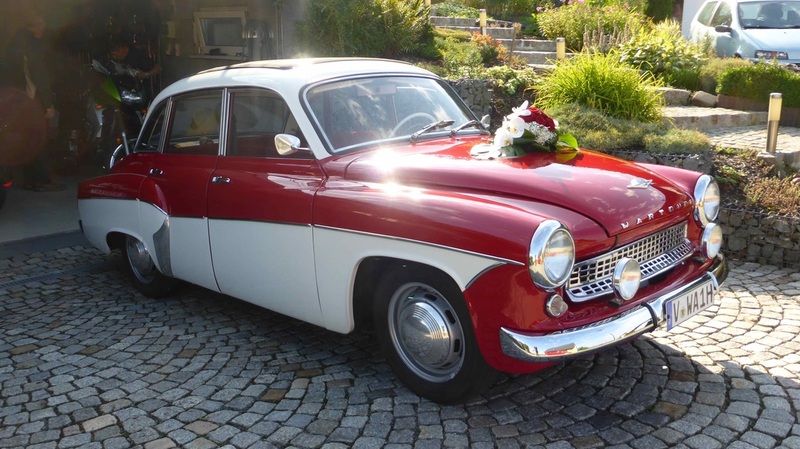 The wedding car, a Wartburg, with a small 2 stroke motor. Nads and Denis sawing the log, to symbolise working together in the future. After the wedding, Jeff headed off to continue his trip, and we spent a few days in Berlin sight seeing before catching the plane back to Oz. 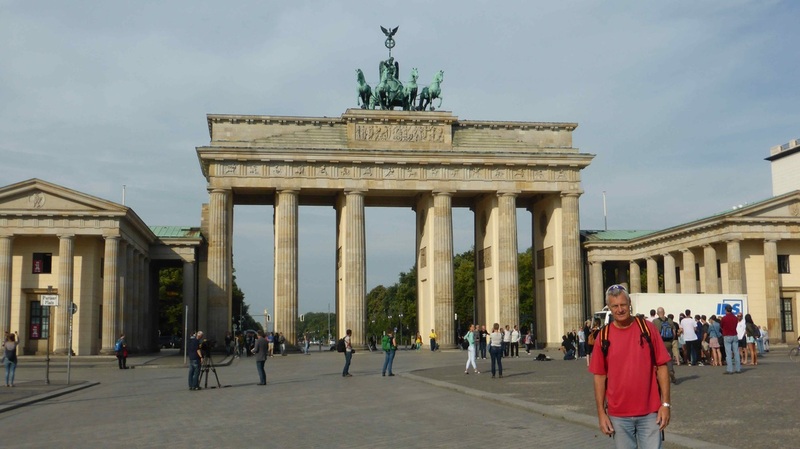 Berlin really is an interesting city, especially with its history around WW2. 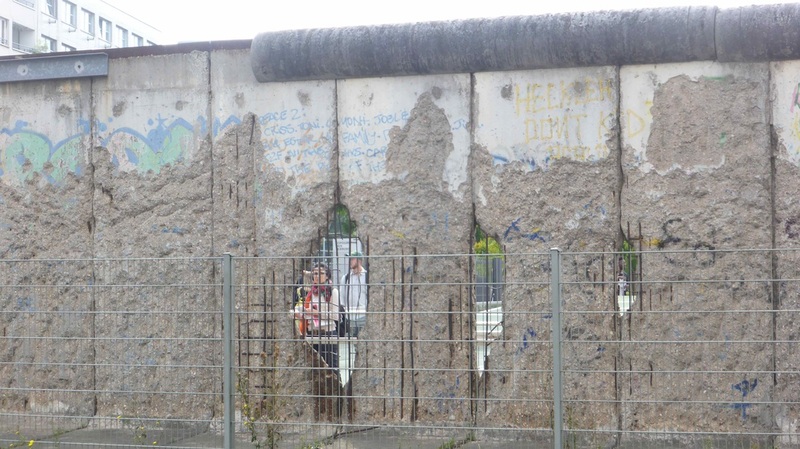 Part of the Berlin Wall, kept as a reminder of the past. 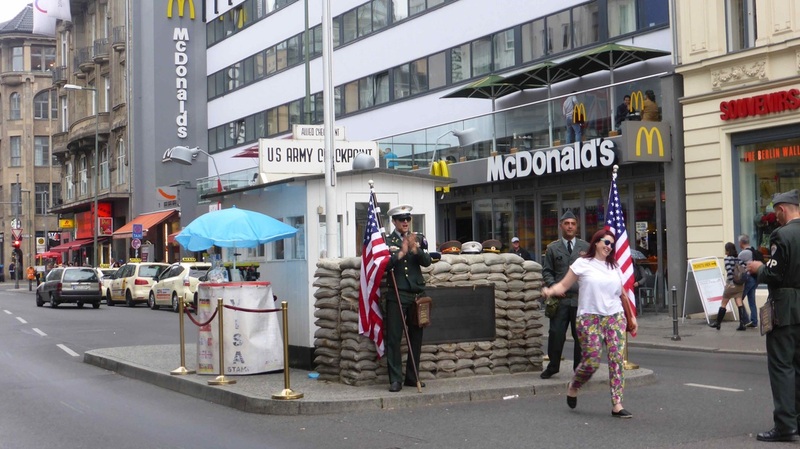 Checkpoint Charlie, now manned by actors for tourists, not soldiers. 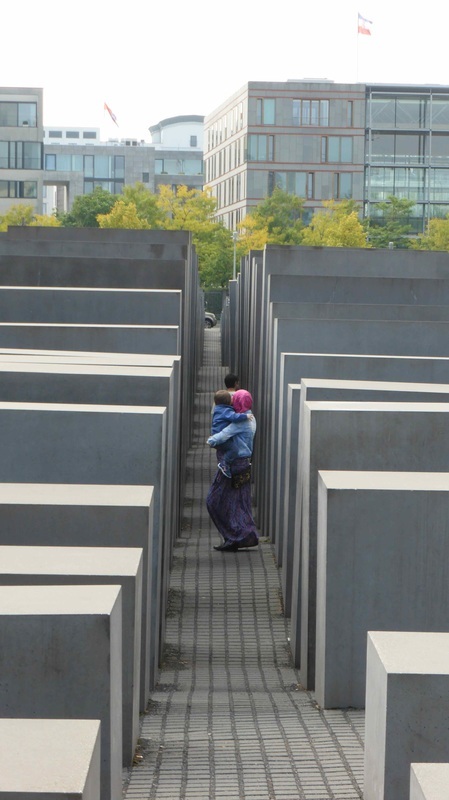 Part of the Holoucaust Memorial.